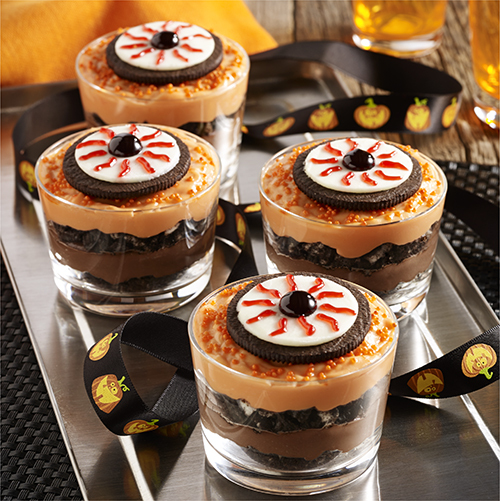 Halloween season has arrived, and while candy is a holiday staple, pudding cups are also a great way to add an extra spooky touch to your party. These creative yet easy-to-make recipes combine Snack Pack® pudding cups and a few finishing touches for treats that will delight ghosts and goblins of all ages. Peanut butter sandwich cookies double as tombstones for this bone-chilling pudding cup treat. You can use crumbled brownies and green sprinkles to decorate your pudding graveyard. Topping your chocolate pudding cup with some “dirt” is easy! Just crush up a couple of chocolate sandwich cookies and sprinkle them on top. A gummy worm crawling out adds the perfect effect. Looking for a pudding treat with real pumpkin flavor? You can blend Snack Pack vanilla pudding with pumpkin, cream cheese and spices for a delightful seasonal treat. Use a pretzel rod and mint sprig to create the stem and leaf on top! Candy corns are an October favorite and the inspiration for this layered pudding treat. Fill your cup with crushed pineapple, then add Snack Pack Butterscotch pudding and top with mini marshmallows. Cut some bananas in half to create the sight of sinister ghosts rising from your pudding cup. Stir in Peter Pan® peanut butter with your chocolate pudding for a delicious blend and use chocolate morsels for the ghosts’ eyes and nose! Mix chocolate pudding with peanut butter, top with cookie halves and finish with decorating gel, and you'll see why this dessert is so good, you'll have to keep an eye on yours.